photograph by Hattie Miles ... 13.03.2018 ... Love Bournemouth Bunnies whizz down the zip wire from the end of Bournemouth Pier. Flying into action the Bournemouth business community has launched the Love Bournemouth Bunnies 2018 competition, with a new augmented reality twist. photograph by Hattie Miles … 13.03.2018 … Love Bournemouth Bunnies whizz down the zip wire from the end of Bournemouth Pier. 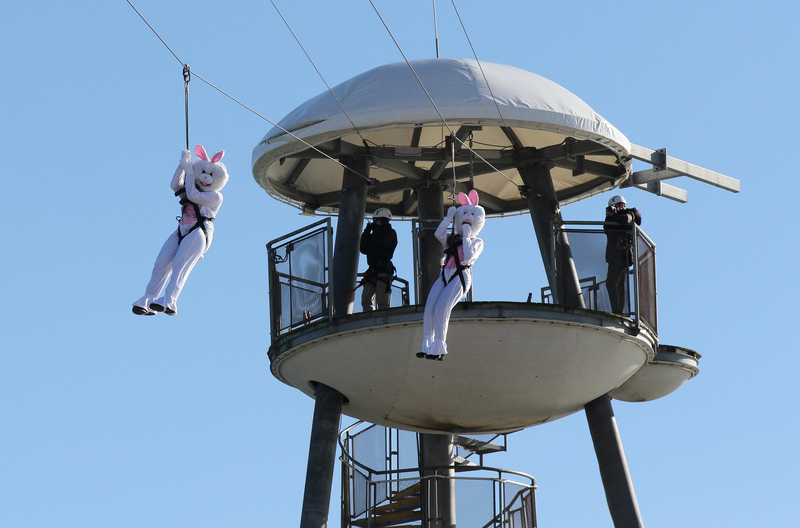 A herd of ‘giant bunnies’ have flown from Bournemouth Pier and across the sky to mark the launch of ‘Love Bournemouth Bunnies’, a special Easter campaign which is uniting Bournemouth’s coastal businesses. Following the brave bunny stunt, near to 50 local businesses managers and decision makers gathered at Rock Reef to celebrate the start of the campaign. A fun, free and interactive activity, Love Bournemouth Bunnies is a special ‘Easter hunt’ aimed at encouraging local residents and visitors to hop, bound and bounce across Bournemouth’s coastal areas in search of over 100 golden and virtual bunnies. Returning for 2018, last year’s Easter competition saw hundreds of adventurous families locate and take selfies with golden bunny statues situated in local businesses. Aiming to repeat this success, the new competition challenges people to explore Bournemouth’s coastal areas, enter a greater number of businesses and find as many bunnies as possible using the free Go Bournemouth Coast app. To find the bunnies, participants must watch out for clues on the Go Bournemouth Coast app, plus Bournemouth Seasons and associated business social media pages. Part of a number of locally planned Easter activities, the Coastal BID will also be bringing fun Easter Weekend events to Boscombe on the 31st March and Southbourne on 2nd April. This will include children’s entertainment and a giant golden bunny in Southbourne to celebrate the season. To download the Go Bournemouth Coast app, visit: www.gobournemouthcoast.co.uk. To find out more about the Coastal BID, please visit www.coastalbid.co.uk. To find out more about their seasonal events, activities and local business promotions, you can connect via social media; Facebook (@bournemouthseasons) Twitter (@bmthseasons).